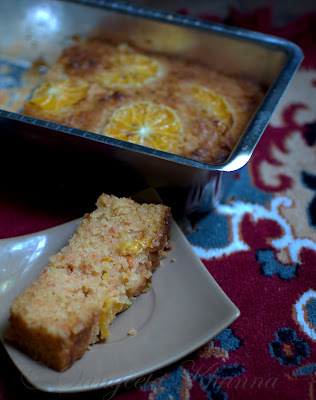 A carrot and orange cake has been a favorite cake at my place since I started experimenting with carrots to make the cakes moist and more flavorful. Yes carrots do impart a richness to cakes without imparting any flavor of carrots to them. This one is richly orange flavored, slightly bitter like a good marmalade and soft and rich. 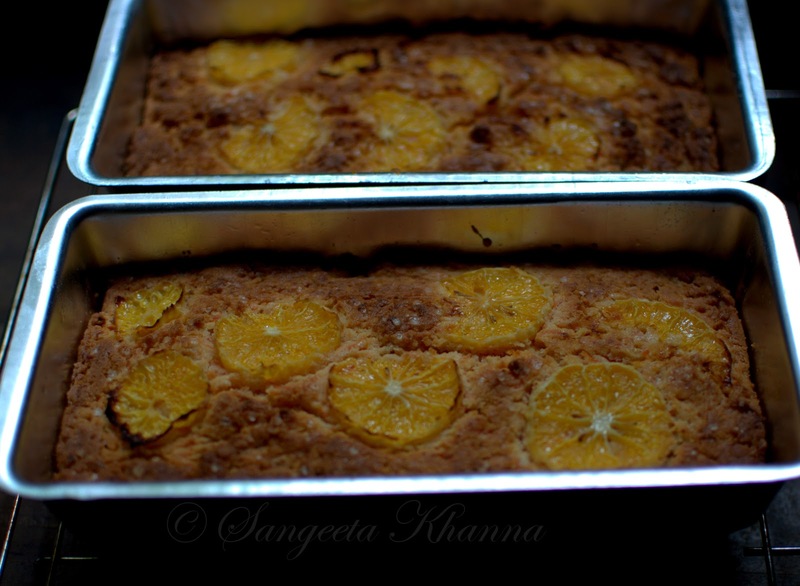 The taste of oranges would linger on for sometime when you eat this cake. Deeply satiating I would say. 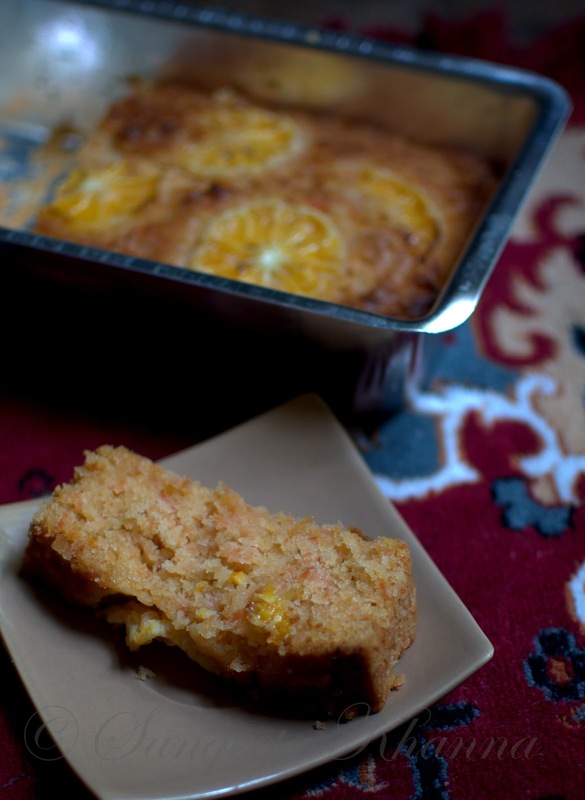 The recipe is easy, just like other recipes on this blog, takes about 20 minutes of preparation time and 40-50 minutes of baking time. Whisk the oil and the yogurt together first, till smooth in a deep mixing bowl. Add the sugar and whip the mixture again till smooth. 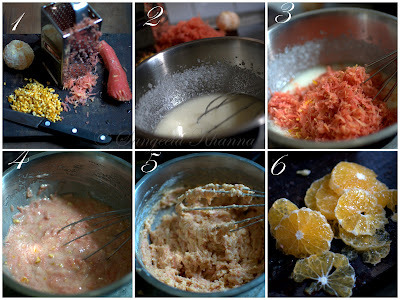 Add the grated carrot and fine chopped bits of orange peel. If you can't chop the orange peel finely, just zest it to get a tbsp of zest. Use lesser if you don't like the slight bitter taste of marmalade or orange zest. Whip everything together. Now mix the dry ingredients with the batter and fold them together softly. Do not whisk too much. The consistency of this batter is not flowing, just dropping and needs to be smoothened into the loaf pan. 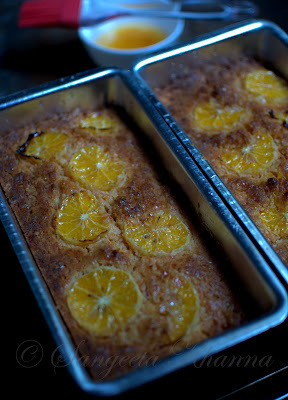 Pour into the loaf pans, smoothen with the help of a spatula and arrange the orange slices over the surface. Bake in a preheated oven at 180 C for 40-50 minutes. Check once after 40 minutes and then decide whether it needs further baking as different ovens need different baking time. For glazing, mix everything together and heat for a minute either in microwave or in a pan till it simmers lightly. Brush on the surface of the cake while the cake is still hot. Let it cool and then slice to serve. You might like to have a drizzle of the glaze mix with the slice as well, or a blob of whipped cream with it. Or may be a scoop of chocolate ice cream. I would like it with hot chocolate sauce in winters for sure. But to tell you the truth, I tasted only half a slice of this cake myself. The one loaf that I kept for ourselves was so lucky it got lapped up by 3 hungry souls who visited our home that day. I had to promise to bake this cake again very soon. I have one more variant of a cake icing/topping that is very popular at my place with fruity whole wheat cakes. 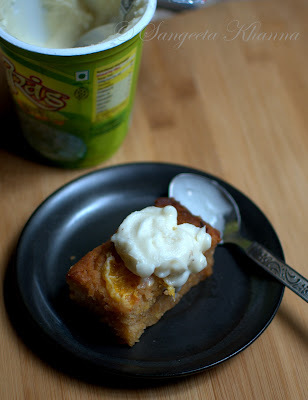 That is a kesar elaichi flavored Shrikhand from Amul. I told you my secret of what I did with my half a slice of this cake. It is like a pairing made in heaven. Yummy. Rich flavors are deeply satiating on the scale of taste and yumminess, cakes should be enjoyed in richest flavors in small quantities so you don't feel deprived. Synthetic flavors are shallow and never provide the much needed satiety and you often end up eating more. And then repenting and feeling guilty about the indulgence. Choose real flavors, real food and see how it transforms your liking. 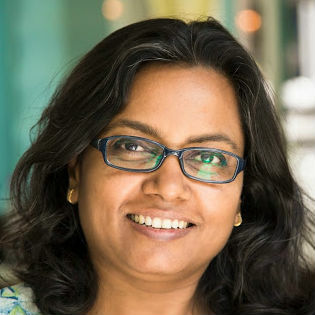 Aha, another one for me, you are blessing, Sangeetha! when you say whole wheat do you mean pastry flour or regular atta? I am so sorry Nagalakshmi, I missed publishing this comment as I was holidaying during that time. I use whole wheat atta for my cakes. Whole whet pastry flour is not easily available in India and had added gluten also. OMG, this looks so yummm. I am dying to try it. Sangeeta I love all your recipes. let me try this one. sounds delicious but I would be using butter (no olive oil at home). Last week I tried walnut ,date syrup ,cinnamon flavoured cake with atta. Came out very well.A rich cake with a distinct flavour. Please do try it.